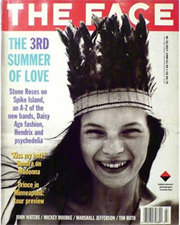 The 16 year old Kate Moss got her first big break being photographed by Corinne Day for the UK magazine The Face. She soon became the magazine’s muse, starring in a series of minimalist, grunge-inspired spreads that ushered in a totally new type of model: rail-thin, undone, and totally different from the supermodels at the time like Cindy Crawford or Naomi Campbell. 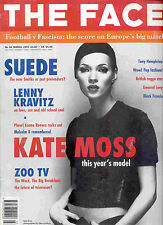 The Face was a London based British music, fashion and culture monthly magazine started in May 1980 by Nick Logan. The magazine was influential in showcasing a number of fashion, music, and style trends of youth culture including New Romantic, and the ‘Hard Times’ look of the early eighties. Its best selling period was in the mid nineties, when editor Richard Benson brought in a team that included art director Lee Swillingham. Benson ensured the magazine’s written content reflected developments in music, art and fashion whilst Swillingham changed the visual direction of the magazine to showcase new photography, commissioning work by Stéphane Sednaoui, Inez Van Lamsweerde, Steven Klein, David LaChapelle, Norbert Schoerner, Glen Luchford, Henry Bond,Craig McDean and Elaine Constantine. 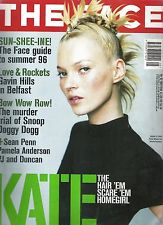 It had a good run but eventually failed, like so many fashion magazines, to sustain itself among dozens of competitors like Dazed and Confused and i-D. And while it’s been shuttered since 2004, The Face is now set to come back after reportedly being bought by the media company Wasted Talent. Wasted Talent will be taking a ‘video-first’ approach. The Face was known for its groundbreaking fashion photography. It helped launch the careers of some of the best photographers like Juergen Teller, David LaChapelle, David Sims, Inez & Vinoodh, and many more.